Authors of this book are from IIT's & IISc and after joining the industry realized gap between university education & the practical FEA. Over the years they learned it via interaction with experts from international community, sharing experience with each other & hard route of trial & error method. The basic aim of this book is to share the knowledge & practices used in the industry with experienced & in particular beginners, so as to reduce the learning curve & avoid reinvention of the cycle. Emphasis is on simple language, practical usage, minimum mathematics & no pre-requisites. All basic concepts of engineering are included as & where it is required. It is hoped that this book would be helpful to beginners, experienced users, managers, group leaders and as additional reading material for university courses. "The Lecture on “Good Engineering Practices for Vehicle Designers” was well received and appreciated by participants." "Thanks for your fruitful training. Our team members are very happy and satisfied about your training." "The project that you did is really a great work for us, because it was the hot issue...and you have simulate in right way .thanks for your Cooperation....."
"I just wanted to say u thank u for everything the book has given me . Truly the book has life in it. . . ."
"Thank you Nitin for you and your team have great support in helping me for FEMFAT based Fatigue Analysis." 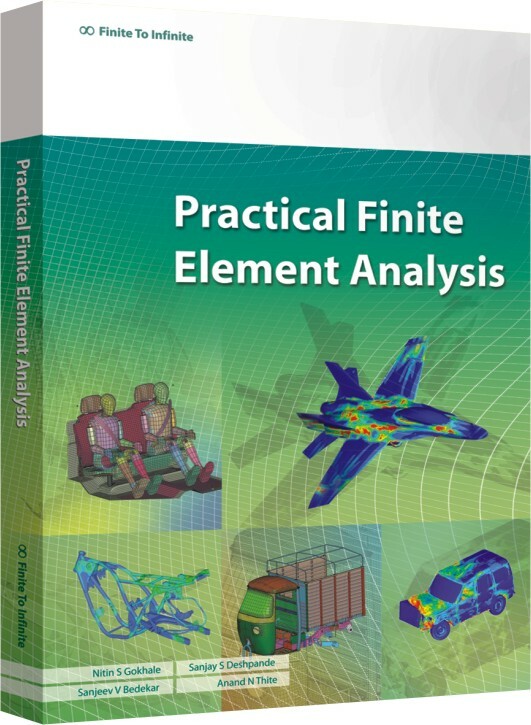 "Finite to Infinite has successfully carried out projects for Bajaj Auto Ltd for Finite Element Analysis (Static, Dynamic and Fatigue Analysis). The Vehicles implemented with the countermeasures are running well on the roads. " "Thank you for the hard work as well as very good performance to do this job." "Advanced FEA Training was Nicely conducted by Mr. Nitin who explained each of the topics from Technical and Practical point of view." "Like a true professional, you have done wonderful jobs at all the customers interactions." "Your Training was very useful. Not only we got used to IDEAS-11, we learnt many useful tips from you." "I want to Thank you for all your teachings given to me. Because of your valuable guidance, I could start and build my career in CAE." "Really appreciate your time. FEMFAT Fatigue simulation is helping us to predict locate early failures, even before proto is ready."